Anai Valley is one of the top tourist destinations in West Sumatra. 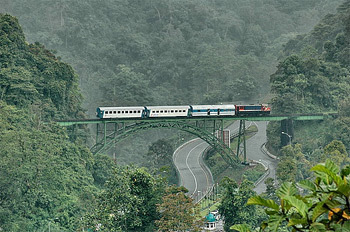 The valley is located near road between Padang and Bukittingi, about 38km from Batusangkar. It is a nature conservation area of about 221 ha, it started during the Dutch colonial time. Prior to getting at the Valley you will pass a winding road with beautiful scenery; many overgrown trees, green hills and valleys, often you will see monkeys close to the road. Although the valley is easily reached, this beautiful valley is also the main route for traffic between Padang and Bukittingi. The river that makes the Anai Valley Waterfall springs at Mount Singgalang and is very clear, flowing down the hills and into the Anai Valley Nature Reserve reaching the edge of a 50 meter high cliff. The mist created by the waterfall creates beautiful colors when the sun shines on it. If you are really, you can meet the rare Sumatran tiger. Other animals living here are gibbons, deers, macaques, anteater, lizards, various types of birds and butterflies. Located 60 km from the city of Padang, to reach this location trips can be reached by public transportation (bus), car rental, or a private car. If using public transportation, the journey begins on the airport Ketaping Padang to Anai Valley Nature Reserve area which takes about 1.5 hours at a cost of about Rp. 20,000-25,000 per person (November 2008). In addition to public transportation, the rail can also be an alternative tourist trips. However, the train only operates every Sunday with a round-trip ticket to executive class Rp 25,000 and Rp 15,000 for economy class.